Things get particularly stressful at Christmas – companies want to generate as many sales as possible with their products while simultaneously preparing for the next sales year. In order to avoid the holiday stress, it’s a good idea to plan ahead. For example, you can order ballpoint pens as promotional gifts now and receive them in time for your Christmas business. This helps you ensure that your customers, business partners and employees receive their Christmas gifts while laying the foundation for the new year, because ballpoint pens are not only extremely popular, but also timeless. It is especially important for companies to stand out from the competition and inspire customers and business partners with original ideas. You can do this by selecting promotional products that suit your company and can be used in a variety of ways. Ballpoint pens are the perfect business gift at Christmas, as they can be used by virtually everyone and thus, increase your reach. With customer giveaways like this, you not only appeal to existing customers but can also interest potential new customers in your products and services. It therefore makes sense to choose a product with your logo, company name or an individual advertising slogan. ADLER offers personalisation on all of their promotional pens. This type of advertising lingers in customers’ memories longer and boosts your sales. Ballpoint pens are always an appealing gift idea. You can give high-quality ballpoint pens in gift packaging as actual presents to business partners and special clients while also adding ballpoint pens to orders as giveaway items. This provides a little surprise during the Christmas season and will help you and your company stand out from your competition. At the same time, a ballpoint pen also communicates your appreciation for the recipient and serves as a thank-you for customer loyalty or a great business relationship. Promotional ballpoint pens can also be part of a gift set. Moreover, ballpoint pens are used considerably more often during the Christmas season, providing you with an increased advertising effect. Ballpoint pens with Christmas motifs create good cheer during the festive season and represent a talking point. With neutral ballpoint pens you can ensure that customers use them over a long period of time, thereby creating great reach. You can add a personal message to ballpoint pens as business gifts, thereby paving the way to good business relations. Long before advent calendars adorn offices and Christmas decorations the streets, you should plan your giveaways for the festive season. 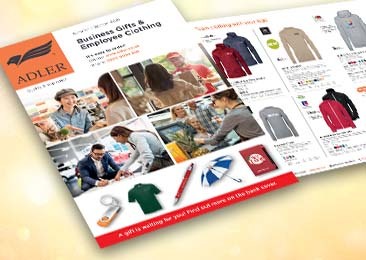 This not only allows you to select your Christmas gifts in a more relaxed way but also helps you find promotional gifts that are perfect for your business. Ballpoint pens as business gifts are ideal advertising tools and available in a huge variety of designs and colours. By planning your promotional items in good time, you can give greater consideration to selecting the right imprint. For example, you can order ballpoint pens for a variety of different target groups, thereby appealing to existing customers as well as potential new customers. With original, Christmas-themed promotional items, you can ensure that your company and brand are remembered. You can plan your promotional gifts weeks or even months ahead of Christmas and the upcoming new year. It is best to personalise the pens, for example with a laser engraving for important business contacts or a company logo for casual customers. Plan your ballpoint pens as business gifts in the right quantities and select an original slogan, so that you can benefit from this promotion for a long time to come. In our online shop, you will find a wide selection of ballpoint pens and other pens that are perfect for Christmas and other occasions.